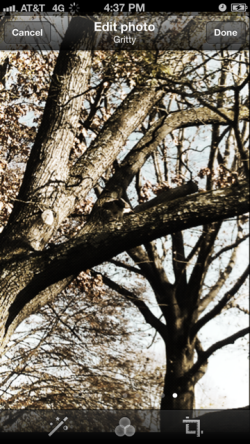 Twitter photo filters: Instagram-style feature will save us from gritty pictures of squirrels. Those who thought Instagram’s public breakup with Twitter would rid their tweet stream of gratuitously grainy landscape photos is out of luck. Just a day after Instagram images stopped appearing on the site, Twitter rolled out its own Instagram-style photo filters, letting users muck up their pictures with settings like “Vignette,” “Warm,” “Cool,” and “Happy.” On the bright side, they can also now do useful things with their photos like crop and resize them. The update became available for Android devices on Monday, and after spending a day in App Store purgatory, it’s now out for iPhones as well. I tested it out on both operating systems and found Twitter’s tools easy to use, if less fun to toy around with than Instagram’s. 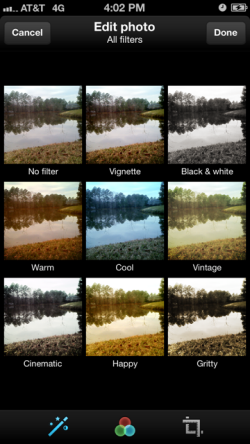 The literal-minded names of the filters, like “Vintage,” “Cinematic,” and “Gritty” (in contrast to Instagram’s “Earlybird,” “Sutro,” or “Walden”) make them feel more utilitarian than playful. For Twitter’s purposes, that’s just fine. As my former colleague Heather Murphy has noted, filters can actually make smartphone photos better when used with discretion. If anything, Twitter’s straightforward labels should serve as a helpful guide to people who might otherwise be tempted to put a “Gritty” filter on a photo of a squirrel sitting in a tree. The new features were actually built not by Twitter itself but by a third-party startup, called Aviary. The Next Web’s Matthew Panzarino speculates that Twitter went with Aviary for speed, so that it would be ready to introduce the filters as soon as Instagram pulled out. That’s possible. Twitter must have been aware for a while that Instagram was eyeing such a move. But it could also just be that Twitter considers filters incidental to its core product, so it didn’t feel a great need to do them in-house. In other words, it isn’t trying to beat Instagram at its own game, and probably couldn’t if it tried. Twitter is a fundamentally text-based service and will probably never be most people’s go-to option for artistic photo-sharing. What it absolutely must do, however, is defend its position as the go-to option for sharing snippets of news with a mass audience in real time. Sometimes news is visual, and Twitter doesn’t want people bypassing it in favor of Instagram every time that’s the case. Hence the need for adequate filters and cropping tools. There is one group on Instagram that is more important than their numbers: Celebrities. And celebrities have loved Twitter more, longer, and in greater numbers than they love Instagram. Celebrities are the big edge that Twitter has always had over Facebook. Zuckerberg and his product team have simply never done a good job courting them. My guess is many of them would rather use Twitter’s photo filters to share a shot with a fan, rather than share an Instagram photo with a smaller, limited social network. UPDATE: As promised—or implied, anyway—here’s a gritty picture of a hawk eating a squirrel. A gritty picture of a hawk eating a squirrel.